Google Earth: High Resolution Satellite Images - Worldwide Coverage - Free! The map above reveals the physical landscape of the African Continent. Important mountainous areas are the Ethiopian Highlands of eastern Africa, the Atlas Mountains along the northwestern coast, and the Drakensberg Range along the southeast African coastline. Eastern Africa is being torn apart by the process of plate tectonics. The great African Rift Valley is made obvious by Lake Tanganyika and Lake Nyasa which occupy its deepest points. Historic rifting opened the Red Sea and rifted the island of Madagascar free from the main continent. Drainage patterns reveal Africa's variable climate. The Sahara Desert is the large streamless expanse of Northern Africa. The Nile is the only major river that successfully crosses the desert. 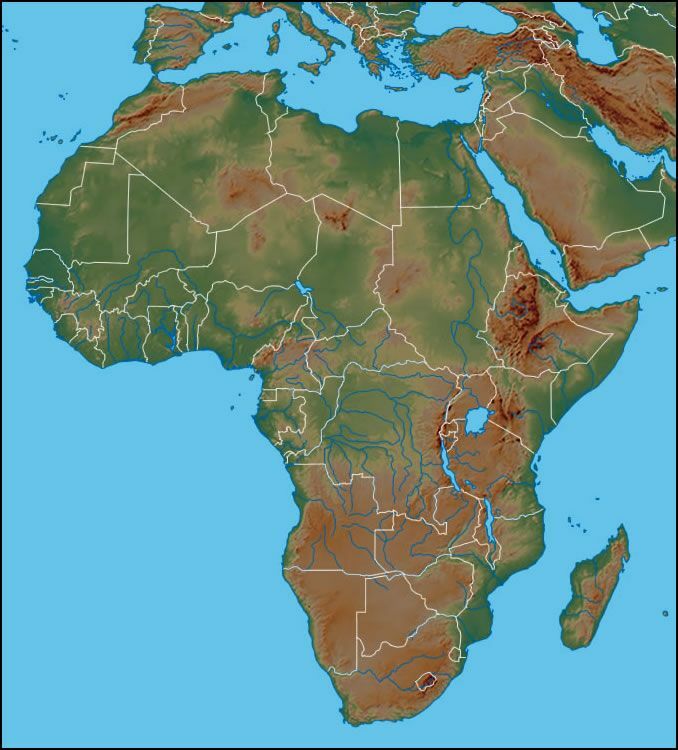 Numerous rivers drain the central portion of Africa just south of the Sahara. Copyright information: The images on this page were composed by Angela King and are copyright by Geology.com © 2006. If you would like to share them with others please link to this page. They are not available for use beyond our websites. The map was produced using data licensed from and copyright by Map Resources © 2006.